Location: On the still-open Harrogate to York line. Location uncertain: possibly at bridge over Park Lane (SE359575) or at level crossing on Hay-a-Park Lane. Both roads were called Hay Park Lane on OS maps of 1854 reproduced below. Notes: The western end of this route originated on 21 July 1845 when the Leeds & Thirsk Railway (L&T) was authorised to construct a branch from its planned main line at Starbeck (where it skirted the eastern fringe of Harrogate) to Knaresborough. 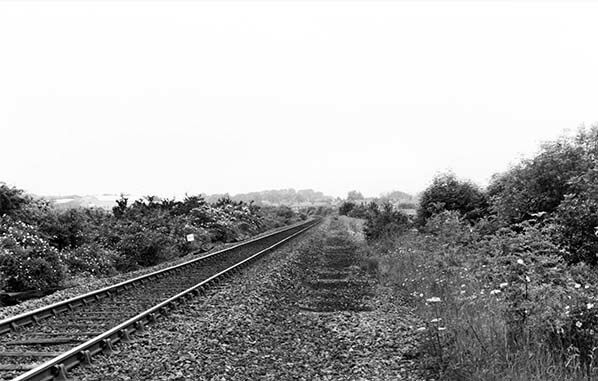 The East & West Yorkshire Junction Railway (EWYJ) – described by Hoole (1974) as a protégé of George Hudson’s York & North Midland Railway (YNM) – was authorised on 16 July 1846 to build from York to Knaresborough. The L&T seemed to be showing excessive interest in the EWYJ in 1847, but Hudson’s influence won the day. At the opening the line from Skelton Junction, where the new route diverged from the Hudson’s York, Newcastle & Berwick Railway, the latter company provided the motive power. The western terminus at its opening on 30 October 1848 was some way short of Knaresborough, rather than at Starbeck (Harrogate). This was a temporary measure because the viaduct over the River Nidd in Knaresborough collapsed on 11 March 1848 as it neared completion. Without this viaduct in place soil from a cutting on the Starbeck side could not be brought across the river where it was needed to make the embankment on the approach to Knaresborough. There is some uncertainty about its location, but information from James Rogers suggests that a temporary station serving trains to and from York at Hay Park Lane (also referred to in some sources as Haya Park Lane and Hay-a-Park Lane) was situated where the embankment commences; level ground would make the building of a station easier at this site. The first train departure from the temporary terminus was on Thursday 13 July 1848 to convey passengers, free-of-charge, to an agricultural show at York; no tickets could be sold as the authorities had refused permission for the line to open. The public opening of the line and station took place on Monday 30 October 1848. The successfully completed viaduct over the Nidd was a fine structure notable for its castellated piers complementing the ruins of the nearby castle. On 21 July 1851 the Leeds Northern Railway (renamed from L&T on 3 July) branch from Starbeck opened to meet the line from York at Knaresborough, and the temporary terminus was closed. The temporary terminus at Knaresborough is not shown on Ordnance Survey maps – thus the uncertainty regarding its location. Fawcett (2001) notes that it consisted of a wooden shed and that the contractor (Mark Faviell & Sons) was to find all the materials for its construction, then remove them when the station was no longer required. If the station was promptly dismantled once it closed in 1851 its absence from OS maps is readily explained. The York-Harrogate route was recommended for closure by Beeching in 1963. For much of its length the railway runs parallel and close to the A59 road, and the only significant population centre served is Knaresborough, with fewer than 10,000 inhabitants in 1961. On 23 September 1964 official notice was given of the intention to close the line, but on 15 September 1966 Barbara Castle, Minister of Transport, refused on the grounds of hardship that would be caused. Economies were exercised by singling the line between Knaresborough and Cattal and between Hammerton and Poppleton but, remarkably, a number of manually operated level crossing gates and semaphore signalling remain at the time of writing (summer 2016). Once considered expendable, the York-Harrogate route has gone from strength to strength with an hourly weekday service calling at all stations and operating to and from Leeds; a further hourly service runs between Knaresborough, Harrogate and Leeds, and there are also frequent Sunday trains. On a number of recent journeys between Harrogate and York the author has noted that the trains are well-used, sometimes with standing room only, even outside rush hour. Organised holidays tours based in Harrogate but visiting York for the day provide many passengers during the summer half of the year. Electrification of the route now seems a real possibility. Looking west in 1987 from the railway bridge over Park Lane (SE359575), the more westerly of the two possible locations of the temporary Knaresborough station of 1848-51. Although published in 1854 this 1:10,560 OS map was surveyed between 1847 - 1849 but the temporary terminus is not shown. The two possible locations, both adjacent to Hay Park Lane are indicated. The permanent station, which opened 21 July 1851 is also not shown on the map.